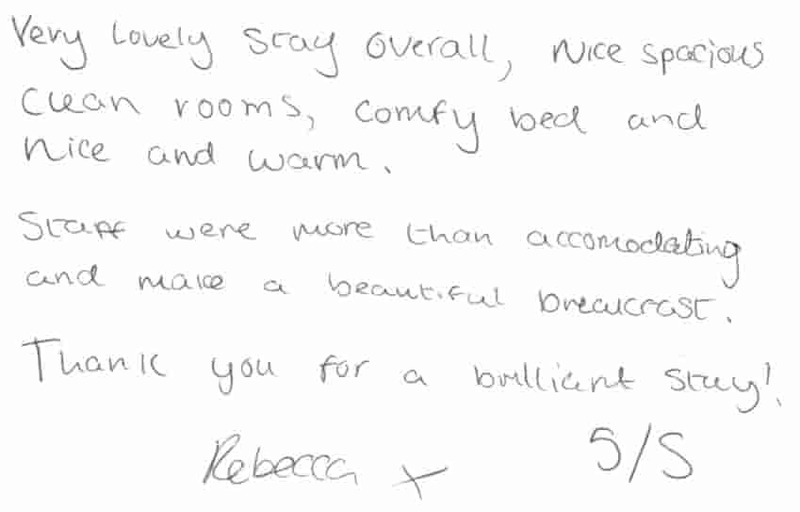 Looking for accommodation near South Tyneside Hospital ? 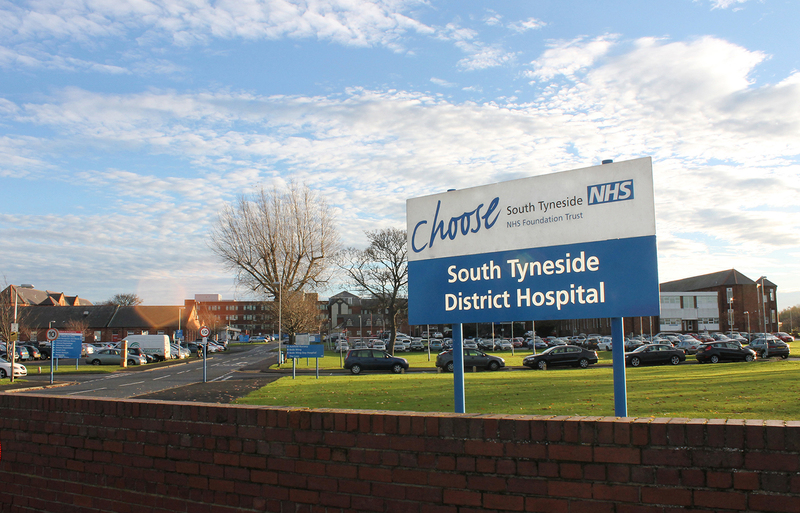 South Tyneside District Hospital provides healthcare services for South Shields, Jarrow, Hebburn, Boldon, Cleadon and Whitburn areas of South Tyneside. Services at South Tyneside District Hospital include accident and emergency, medical and surgical wards, radiology, maternity, orthopaedics, intensive care, anaesthetics, physiotherapy, pharmacy and care of the elderly. Their website is here: South Tyneside Hospital (opens in a new window). 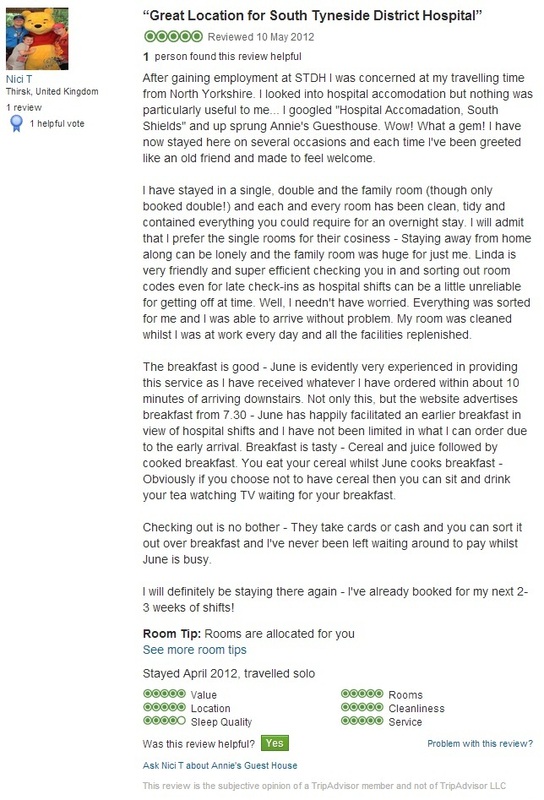 Annie's Guest House is a popular choice of accommodation for visitors, temporary staff and examination candidates visiting South Tyneside District Hospital, Harton Lane, South Shields, NE34 0PL. Note: we actually serve breakfast from 6.30am seven days a week. Our accommodation is located two miles from the main hospital site on Harton Lane, South Shields, NE33 0PL. This is approximately an eight minutes drive or ten minute journey using public transport. If you prefer, there are numerous local taxi firms who can transport you door-to-door for a few pounds. You can see our location on the map on the right. 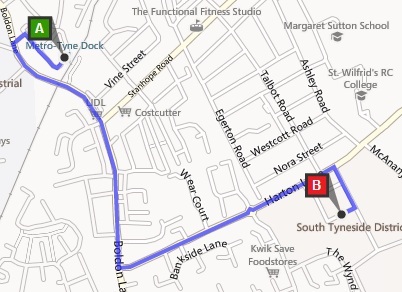 A = Annie's Guest House, B = South Tyneside District Hospital. Journey time by car or bus is less than ten minutes. 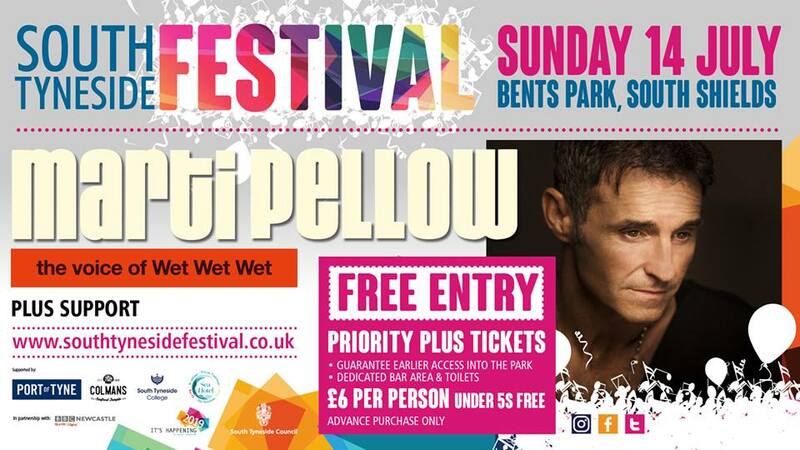 Parking is free and unrestricted outside our South Shields B&B although the car parking facilities at South Tyneside District Hospital are charged for at the following rates: Up to 1 hour - £1.20; up to 24 hours - £3.60; weekly pass - £8.50 (correct Summer 2015). There is no charge for registered disabled "Blue Badge" holders. If you plan to travel to South Tyneside District Hospital by public transport then this is easily possible. One option is via Tyne and Wear Metro. The closest Metro (train) station to South Tyneside Hospital is Tyne Dock. A one-way ticket costs £1.80, a return/all day ticket costs £2.70 (prices correct Janaury 2015). South Shields is on the right of the map. If you're staying with us you will board the bus at South Shields Town Hall then disembark nine stops further along at South Tyneside District Hospital. The timetable for this bus route (updated 4th September 2016) can be previewed below. A link to download a high-quality copy is beneath the preview. Journey time by bus is seven minutes from South Shields town hall which is at the bottom of our street. 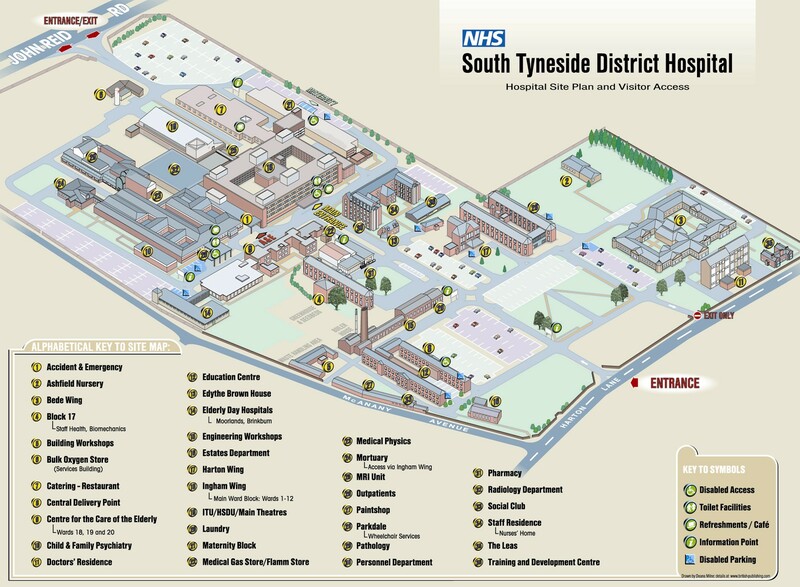 To download a copy of the main hospital site plan click here: South Tyneside Hospital Site Map (opens in a new window). The main hospital site comprises: Accident & Emergency; Ashfield Nursery; Bede Wing; Block 17 - Staff Health, Biomechanics; Centre for the Care of the Elderly - wards 18, 19 and 20; Child & Family Psychiatry; Doctor's Residence; Education Centre; Edythe Brown House; Elderly Day Hospitals - Moorlands, Brinkburn; Harton Wing; Ingham Wing - main ward block, wards 1-12; ITU, HSDU, main theatres; Maternity Block; Medical Physics; Mortuary - access via Ingham Wing; MRI Unit; Outpatients; Parkdale - wheelchair services; Pathology; Radiology Department; Staff residence - nurses home; The Leas and the Training and Development Centre. 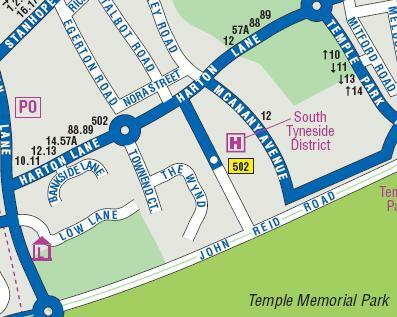 As you can see from the map above if using the recommended bus route #88 stop on Harton Lane (lower right on map) the main entrance to the hospital is straight ahead. 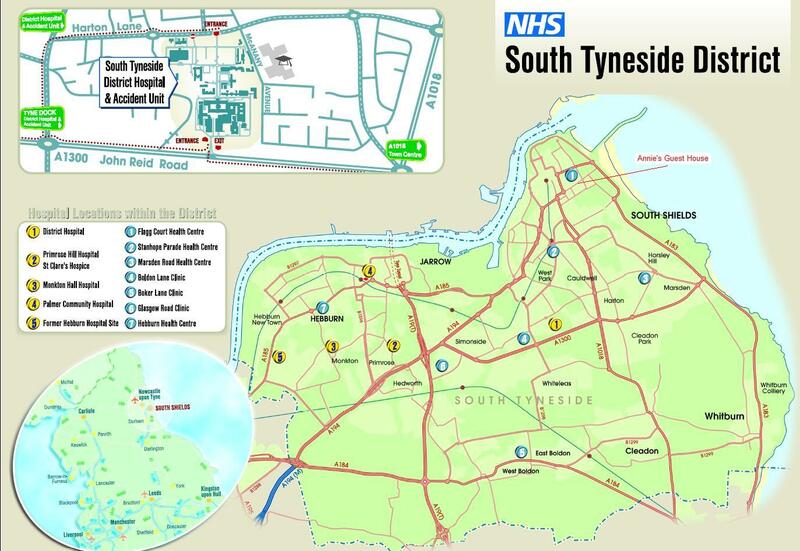 To download a copy of the above site map click here: South Tyneside Hospital Sites Map (opens in a new window). 1) South Tyneside District Hospital main site, Harton Lane, South Shields, NE34 OPL. 2) Primrose Hill Hospital and St Clare's Hospice, Primrose Terrace, Jarrow, NE32 5HA. 3) Monkton Hall Hospital, Monkton Lane, Jarrow, NE32 5NN. 4) Palmer Community Hospital, Wear Street, Jarrow, NE32 3UX. 5) Former Hebburn Hospital site, Hospital Drive, Hebburn, South Tyneside NE31 2TH. 1) Flagg Court Health Centre, Dale Street, South Shields, NE33 2LX (a two minute walk from our accommodation). 2) Stanhope Parade Health Centre, Gordon Street, South Shields, NE33 4JP. 3) Marsden Road Health Centre, Cleadon Park Primary Care Centre, Prince Edward Road, South Shields, NE34 7QD. 4) Boldon Lane Clinic, Boldon Lane, South Shields, NE34 0NB. 5) Boker Lane Clinic, East Boldon, NE36 0RY. 6) Glasgow Road Clinic, Jarrow, NE32 4AU. 7) Hebburn Health Centre, Campbell Park Road, Hebburn, NE31 2SP.